Richard’s explanation is pragmatic and realistic. So as a cancer survivor, patient, or someone generally concerned about their cancer risk factors, what do you do with this complex equation? How do you begin to take practical steps to protect yourself from environmental carcinogens? Is it even worth it? Where do you draw the line between common sense reduction of exposure to toxins and living in a bubble, like Julianne Moore’s character in the 1995 movie Safe? (A creepy, fantastic, and disturbing film.) How do you begin to parse out real information and practical, affordable solutions from greenwashing and/or costly, time consuming eco-trends and eco-tips? The answer to these questions are different for everybody. In a forthcoming series of blog posts I want to share with you some of the habits I have adopted over the past few years to reduce my exposure to carcinogens. What is practical and affordable for me might not be for you. My habits might seem too stringent or too weak. Rather than setting forth a prescription for reducing your contact with carcinogens, I just want to give you a glimpse inside my life so you can try on for size what you wish. Stay tuned for more posts in this realistic series on Reducing Your Exposure to Carcinogens. 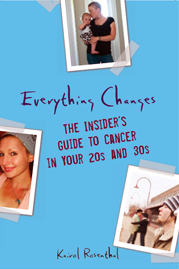 For more info on cancer and the environment, check out Everything Changes: The Insider’s Guide to Cancer in Your 20s and 30s.